I started my career in the City working for the Legal & General Assurance Society in the much criticised Temple Court headquarters in Queen Victoria Street. Although the company had plonked a ‘restored’ part of the Roman Temple of Mithras (discovered during construction) on the forecourt, the building was seen as an example of poor, unimaginative 1950s design. It has now been demolished and a new facility has been created in Wallbrook for people to view the Temple and some of the fascinating Roman period artifacts that miraculously survived successive redevelopments. You will find more on the London Mithraeum website. The City then was home to numerous insurance companies but many have now either decamped elsewhere or become subsumed into larger entities. I have been hunting for traces of their existence and, like the Roman ruins, many pieces of evidence have survived. 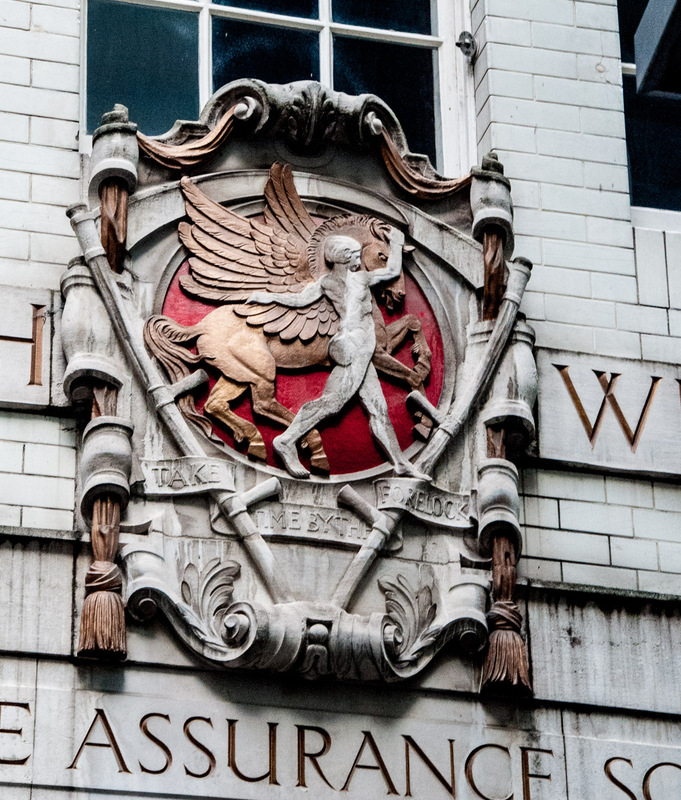 Take a walk down the shadowy and rather mysterious Change Alley and you will come across a building that once housed the Scottish Widows insurance company along with its magnificent crest. 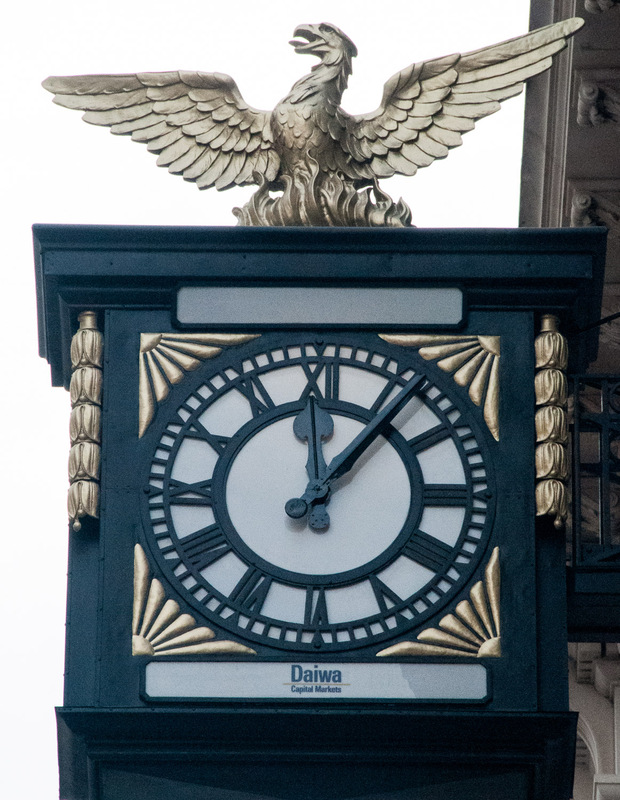 At the centre is the mythical winged horse, Pegasus, symbol of immortality and mastery of time. A naked figure, the Greek hero Bellerophon, is shown grasping its mane. In mythology, Bellerophon captured Pegasus and rode him into battle. This explains the motto ‘Take time by the forelock’, or ‘seize the opportunity’. Presumably time could be tamed by taking out a Scottish Widows policy to make provision against the uncertainties of the future. 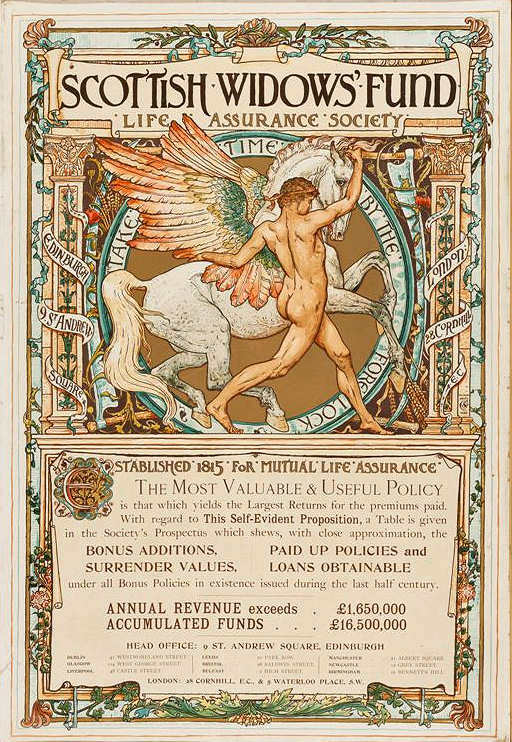 This striking piece of advertising features a beautiful full colour version of the Pegasus motif created by Walter Crane. Crane (1845 – 1915) was an English artist and book illustrator. He is considered to be the most influential, and among the most prolific, children’s book creator of his generation. Fast forward to the present day and Scottish Widows is now part of Lloyds Banking group, its corporate symbol now being the beautiful ‘Scottish Widow’. 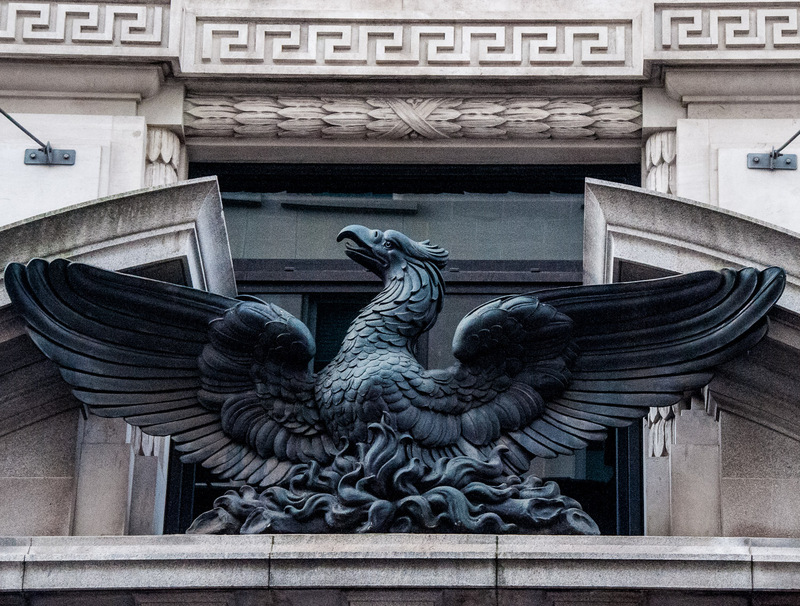 Rising from the flames and just about to take off over the City is the legendary Phoenix bird and from 1915 until 1983 this was the headquarters of the Phoenix Assurance Company. One can see why the Phoenix legend of rebirth and restoration appealed as the name for an insurance company. 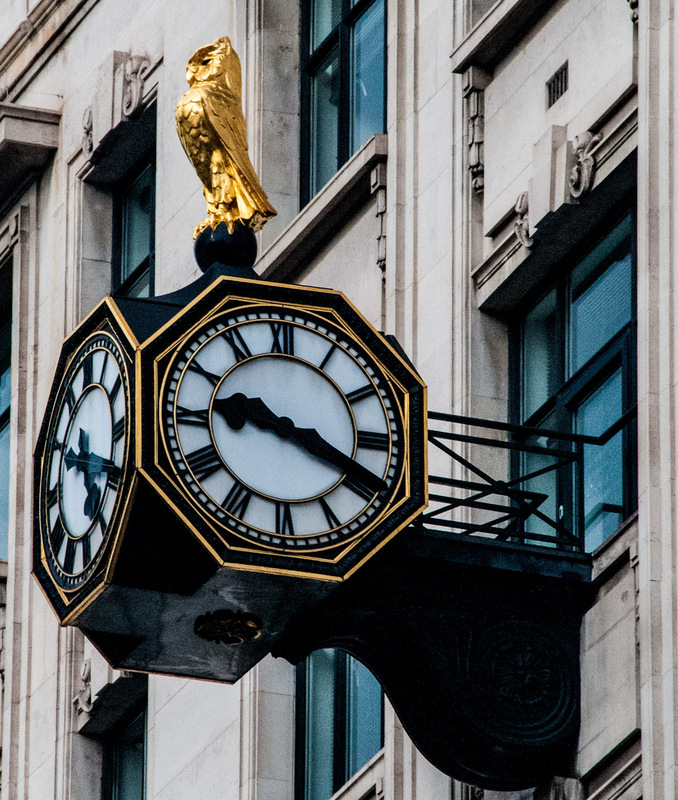 Insurance companies often seemed to favour having clocks outside their buildings – a neat form of advertising when not everyone could afford a watch. This wise old owl looks across the road to the north side of London Bridge, observing the thousands of commuters flowing back and forth every day from London Bridge Station. 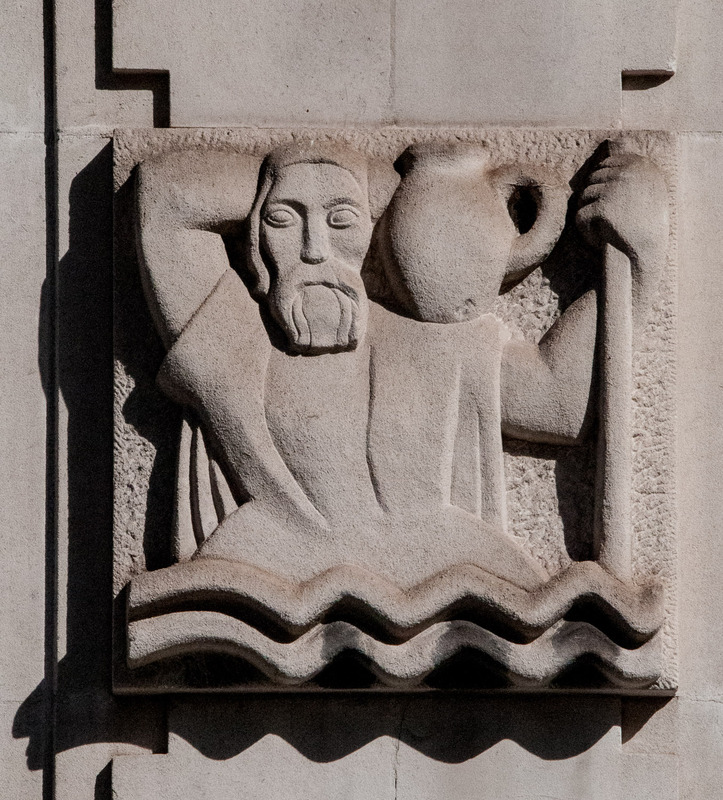 He is perched outside what was once the offices of the Guardian Royal Exchange Insurance Company (later just ‘Guardian’) and was for a while their symbol, presumably signifying wisdom and watchfulness. 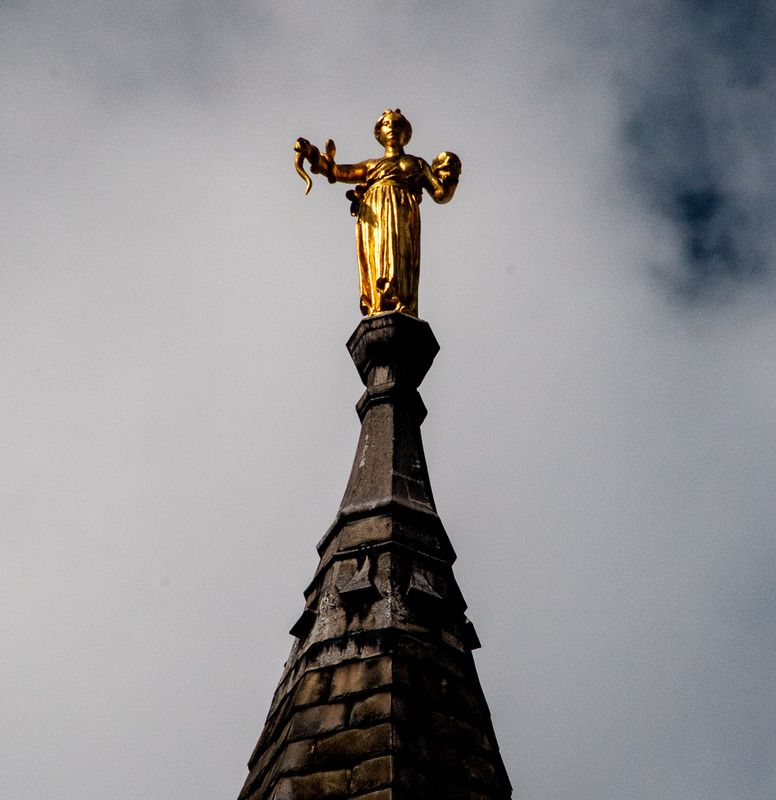 Since 1893 this golden lady has been standing at the top of 13-15 Moorgate facing the Bank of England. Her image is repeated on the side of the building. 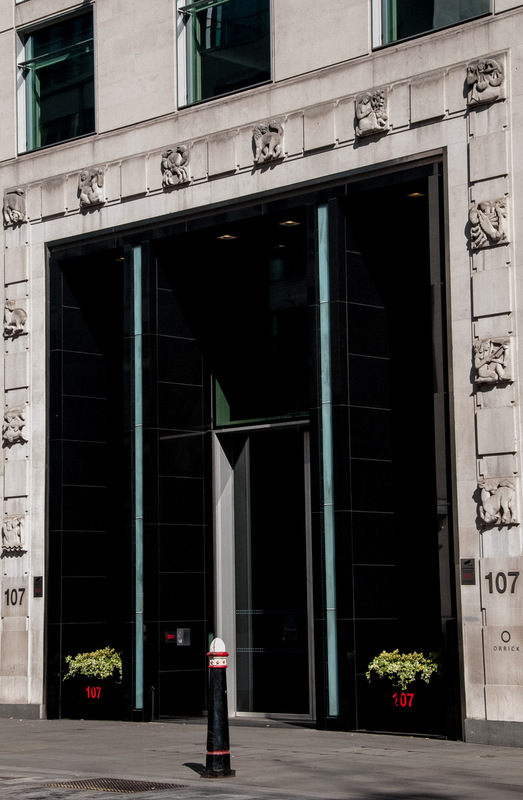 This was originally the London headquarters of the Metropolitan Life Assurance Society. 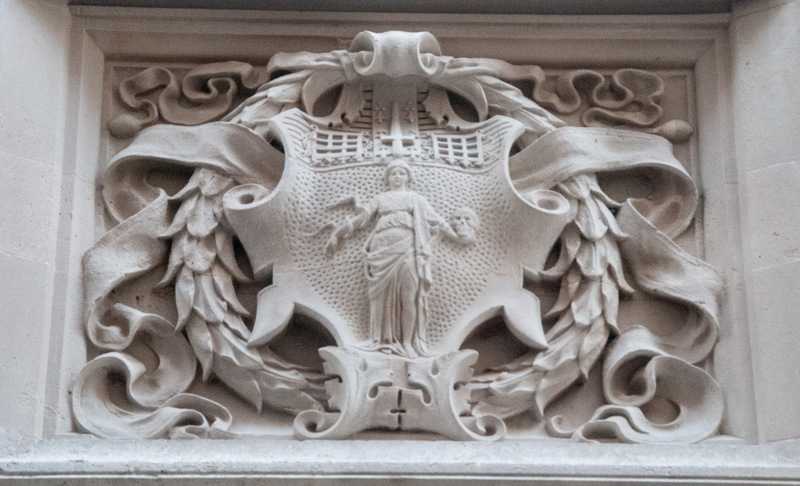 The lady comes from its coat of arms (granted in 1885) which show her holding a skull (mortality) in her left hand with a serpent (signifying wisdom) entwined on her right. 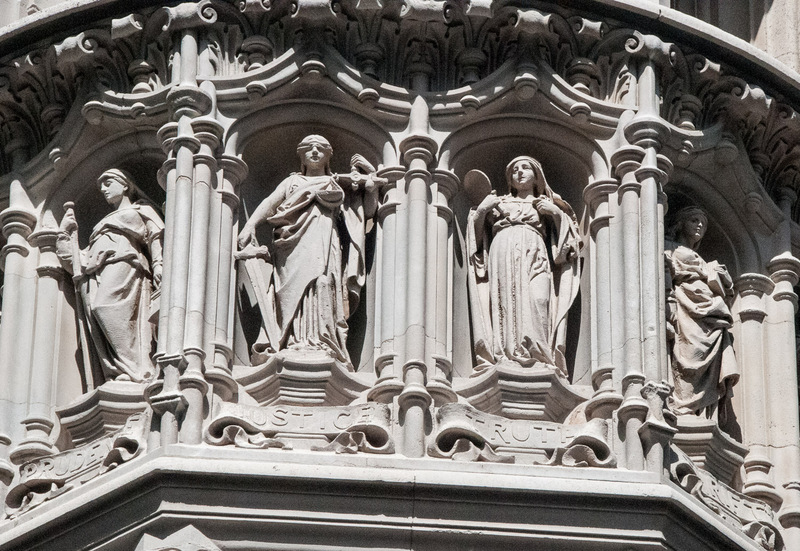 The building also incorporates an attractive set of figures representing Prudence, Justice, Truth and Thrift – presumably all Virtues that the Insurer would like to be identified with. Some sadly rather dusty ladies in Fleet Street on what were once the offices of the Norwich Union Insurance Company (now Aviva). 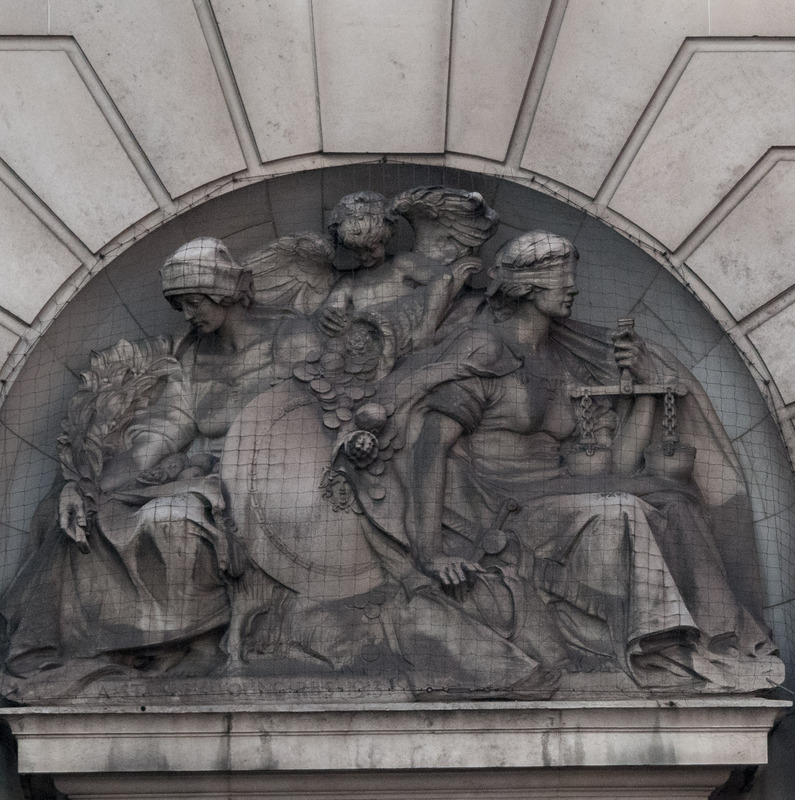 Prudence is on the left, with her little hoard of fruits and a leafy branch whilst the cherubic figure of Liberality , or Plenty , spills his cornucopia of coins and fruits over Lady Justice’s shield. She is probably there because the entrance arch is shared with Serjeants’ Inn and, as usual, she holds scales and a sword. 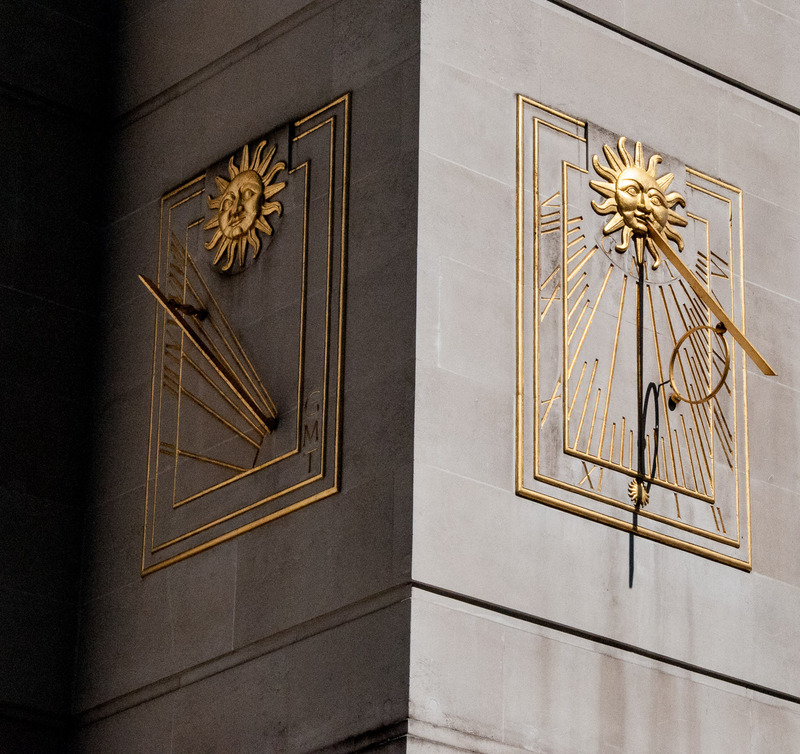 And finally, completed in 1958 for the Sun Life Assurance Society, these two sundials incorporate the company’s sunburst logo.The south facing sundial has the letters GMT under the sun face and covers hours from 8:00 am to 6:00 pm. The west facing sundial also shows the letters GMT in the bottom right corner of the dial and covers the hours 2:00 in the afternoon until 7:00 in the evening. 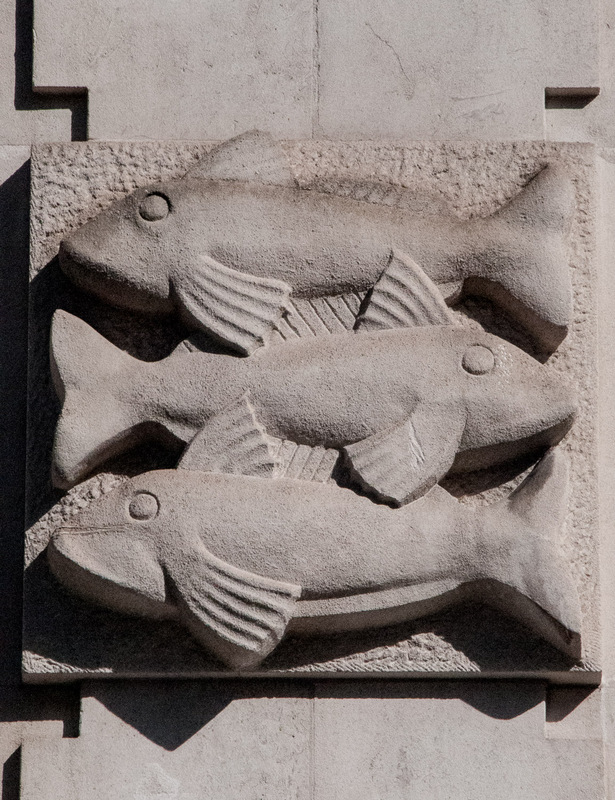 Also at 107 Cheapside you will find a splendid collection of Zodiacal signs arranged in twelve relief panels around the main door. When the Lord Mayor opened the building in July 1958 he said he felt sure that the signs would ‘attract a considerable number of people to inquire what you can do for them’. This would have been a remarkable marketing success, but sadly there is no record of long queues forming to purchase life insurance. 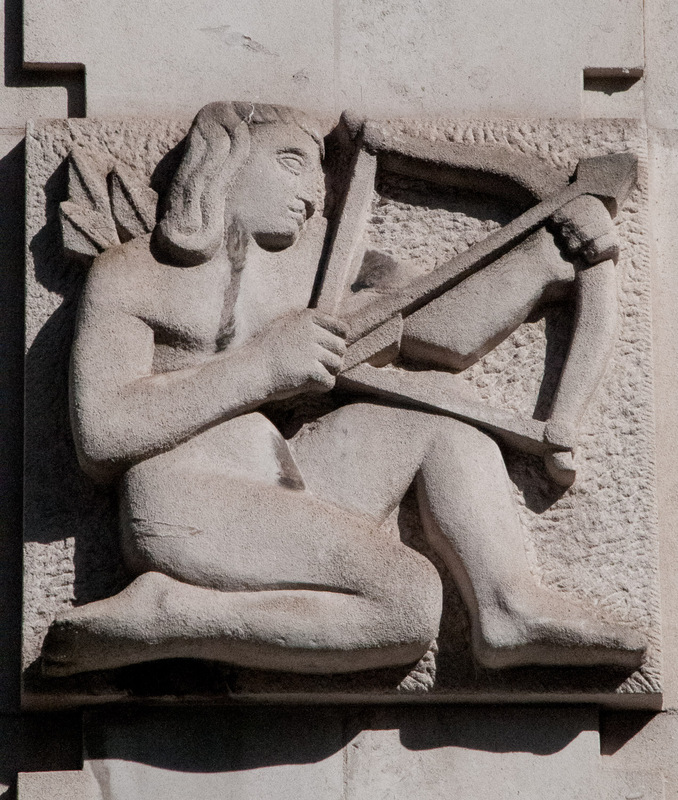 The sculptor was John Skeaping who, incidentally, was Barbara Hepworth’s first husband. I suspect many of us pass by these buildings without ever noticing the signs from a bygone time. Thanks for the interesting insight.